Call Squeegee Klean today to see if you qualify for our regularly scheduled window cleaning service. 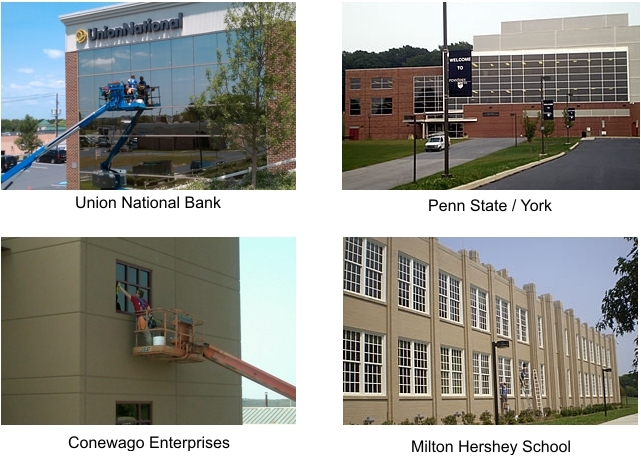 Squeegee Klean commercial window cleaning company services a wide variety of commercial accounts throughout south central Pennsylvania and northern Maryland for business owners and managers who are serious about the appearance of their storefronts, offices, warehouses and industrial buildings. A clean storefront is an inviting storefront. 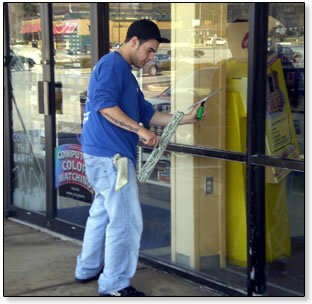 Squeegee Klean commercial window cleaning company can keep your storefront glass sparkling clean so that you, your employees and your customers want to step inside your shop. While we’re there, you may hardly know it. We arrive in a clean, lettered vehicle. Our reliable, trustworthy and experienced crew-members are always in uniform-and trained to go out of their way to minimize disruption to your business while on your premises. In fact, company policy provides that if we are near a door when one of your customers is entering or exiting, we kindly stop what we are doing and open the door for them. 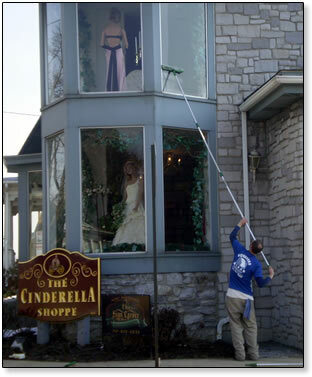 If you are serious about the cleanliness of your establishment’s windows, give us a call. The more traffic your storefront generates, the cleaner you want it to be. We typically recommend monthly or biweekly service for storefront accounts. Whatever your preference, we will be happy to set you up on a recurring schedule of your choosing. Then, we’ll efficiently and effectively clean your windows so that you and your employees can focus on your business and your customers. A word about pricing. It is not our practice to underbid to get work. We charge a fair, industry-standard price for quality service. For more information, please see our How We Price page. Call Squeegee Klean commercial window cleaning company today to see if you qualify for our regularly scheduled window cleaning service. 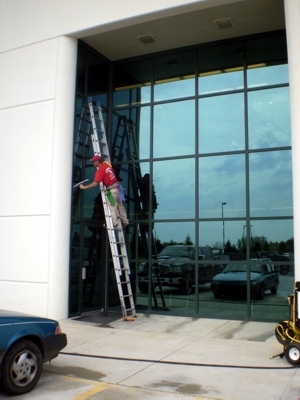 Squeegee Klean services a wide variety of commercial and industrial buildings up to four stories tall. From start to finish, we seek to minimize disruption of your business activities while providing you with superior quality service. 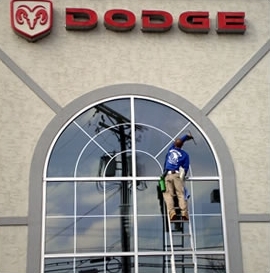 We come to your building in clean, lettered vehicles. While in your building, our reliable and uniformed crews work quietly and efficiently, being careful not to disturb desks, paperwork, computers, materials or machinery. That way, you and your employees can focus on your business and your customers. If necessary, we can handle your interior window cleaning after hours or on weekends to avoid disrupting your operations. Once you become a Squeegee Klean customer, you never have to make another call for window-cleaning service. We will clean your windows on a recurring schedule of your choosing. We typically recommend a monthly, quarterly, semi-annual or annual service for corporate accounts. A word about pricing. It is not our practice to underbid to get work. We charge a fair, industry-standard price for quality service. For more information, please see our How We Price page. We are industry leaders in construction clean up. We are well aware of job requirements, work well around other contractors and understand the the term “deadline”. All of our technicians are made aware of potential problems that occur with new glass, such as fabricating debris. In fact most times we even need to inform the contractor of this serious issue that is growing problem in our industry. In most cases we can clean everything from the windows to the walls.